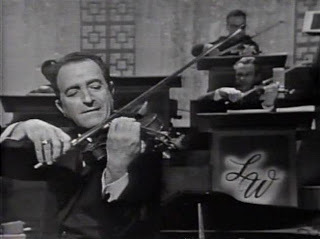 Joe Livoti joined the Lawrence Welk Show 1962 as first violinist, replacing Jimmy Getzoff. Livoti was born in Cambridge, Massachusetts on September 24, 1912, and first took up playing the violin after attending a musical recital given by the legendary violinist Mischa Elman. At the age of twelve, he earned a scholarship to study at the Boston Conservatory of Music and, at the age of 13, won an Italian Violin which he continued to play throughout his career. While on the Lawrence Welk Show, one of his more popular numbers is "Wild Dog", in which he performed along with Neil Levang at guitar as well as duets with another talented violinist on the Welk Show, Bob Lido. Livoti and his wife Erma, were the parents of two kids. One of them, daughter Sylvia, appeared as a guest several times on the show in the early 1960s as a singer. Livoti died in 1998.